A number of independent sources confirm Obamacare is harming small businesses. According to a paper published by the American Action Forum last September, the increased burden of regulations and rising health insurance premiums have reduced pay in firms with 20 to 99 employees by at least $22.6 billion annually, and has led to 350,000 job losses. Employees who kept their jobs have seen a decrease in pay of just under $1,000 annually. Relief for the smallest businesses alone is not helpful because it makes it more expensive to grow. Although businesses with fewer than 50 employees are exempt from the requirement that they offer their workers so-called “affordable” government-approved policies (the employer mandate), the mandate only imposes a high marginal cost to hiring a 50th worker. The administration has implicitly accepted the case that the employer mandate harms businesses by delaying it twice, until January 1, 2016, for businesses with 50 to 99 employees. In other words, we have not yet seen the worst of how Obamacare will hit small businesses. Perhaps more insidious is the way Obamacare punishes employees who want to work longer hours. Obamacare tax credits phase out as household incomes increase. The harmful effect on workers’ willingness to earn more money is reflected in the Congressional Budget Office’s (CBO) conclusion that Obamacare would reduce employment by 1.5 percent in 2017 and 2.0 percent by 2024 (amounting to 2 million to 2.5 million jobs). Fortunately, an opportunity to mitigate this problem may be at hand. 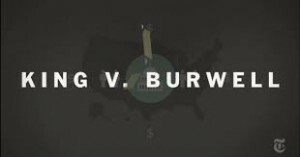 This summer, the Supreme Court will decide King v. Burwell, a case through which the plaintiffs seek to stop the administration from paying tax credits to health insurers operating in the 34 states with federally facilitated exchanges. This would cause premiums in those states to increase dramatically. Although the employer mandate would also be permanently relieved in those states as a result of a decision for the plaintiffs, their residents and businesses would still be paying federal taxes that fund tax credits in other states. This outcome would be unfair and politically untenable. Thus, there is an opportunity to amend the Affordable Care Act to minimize its harm to small businesses. Obviously, Congress cannot repeal the entire ACA, because President Obama must sign any amendment this summer. – Complete elimination of the employer mandate nationwide. – Restoring insurance regulation to the states by eliminating the Secretary of Health and Human Services’ power to define “Essential Health Benefits” and other Obamacare regulations such as Minimum Loss Ratio for health insurers (which reduce the number of insurers competing). – The most important regulation to eliminate is the age band of 3:1. Section 1201 of Obamacare gives the secretary power to dictate this, which means an insurer cannot charge a 64-year-old more than three times as much as a 19-year-old. A more accurate age band would be about 5:1. This artificially increases the premiums of young people, making it more expensive to hire them. – Flatten Obamacare’s tax credits as much as possible to reduce the marginal income tax “cliffs” that harm the incentive to work. – Eliminate the mandate for individuals to buy health insurance through an exchange in order to have their premium reduced by a tax credit. This will allow state governments to get out of the health insurance exchange business and eliminate the risk that small businesses will be taxed to finance their operations.